I was talking to my dog, Storm, the other day. My wife had just teased her about not picking up a goose during hunting season last year. She picked one up during drills, but just couldn't seem to get it together during the hunt. She dragged it, dropped it, ran back towards me. Sometimes it just takes some time for them to "get it". I sat with her and told her that she was my little girl and that I didn't care if she ever picked up a goose, that its all okay with me. She does love to retrieve, and will pick up a duck but the goose thing has eluded her so far. And that got me thinking just how different dog's personalities can be, and just how different Storm's personality was than my former dog, Bas. Storm likes affection, loves to be petted and talked to and babied. 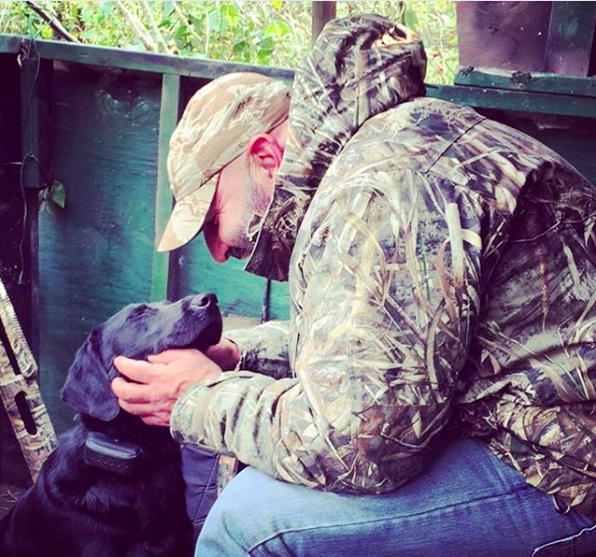 Bas didn't care about affection, and if you tried to pet him in the duck or goose blind, he would shake his head to get your hand off of him. He was focused and that was that. He seemed to be saying, Leave me alone, I am hunting here. And then he would whine if I missed and sigh if the birds weren't flying. And he tackled geese full speed and moaned while it was in his mouth, he loved it so much. Storm looks a situation over, she's a thinker. She isn't as crazy brave as Bas was and that is just her personality. So I get with my buddy Steve and we figure out ways to train her that fit her personality. Because, Steve and I have a saying that goes, "It is never the dog's fault." Meaning, if the dog isn't getting it, figure out a way that she does get it. It is up to you as her coach. Its the same with coaching people. If you are too dogmatic with your approach and think that it is your way or nothin', you may need to reconsider your methods. It took a long time for me to get to the point where I didn't insist that everyone HAS to squat. Back squat that is. Nothing wrong with squat variations , especially for those that aren't built to barbell squat. Safety squats, front squats, belt squats, machine squats are all alternatives. Do I think that they are better than the back squat? Not really, but I'd rather have someone performing squat variations than not squatting at all. And the bench press also. With the techniques taught these days to offensive and defensive lineman, where their arms are extended away from the body (posting, reaching, slapping the shoulder), their shoulders are all jacked up and the regular bench press bothers some of the lineman's shoulder's. So they are prescribed variations also- Dumbbell bench, dumbbell incline, machine bench, weighted pushups (elbows in), reverse grip bench, etc. If its pain free, then it is worth it. Pretty much common sense. It is the same with diet. If you have someone who fails miserably on low carb and has a tendency to blow it and binge when it gets tough, use carb cycling. Adherence to the diet is much better than the failure over and over again. Fall is here and the geese have begun arriving from the North lands. My son , James came running into the house the other night. He was yelling, " Dad, the geese are here and they are flying high!" and I didn't believe him. Until I went to his baseball practice that night and bunches of geese were flying overhead, plus my goose hunting buddy in Maryland, Steve texted me , "The geese have arrived!" I have been hunting for a long time and the geese arriving always brings a smile to my face and a warm feeling in my bones. It brings back memories of my first goose, of my son's first goose, of setting out decoys and being giddy with anticipation of the morning's hunt. And you never know what the day will bring, but if they fly, its wonderful, and if they don't, that is okay too. Just being there is enough. The hunt means more than killing, much more. It is looking at your son scanning the skies, it is laughing and telling stories with your friends, it is opening your Thermos after a few hours after the hunt has began and finding your black coffee still warm, it's your dog nuzzling against your leg, it's the warmth of the homemade whiskey after the hunt by the fire and the stories of the days hunt, whether good or bad. It is nearly always good. I have always thought that it is the anticipation that is most fun, and I realized that a long time ago. However, all of that being said, it is pretty darn special when the geese are fooled by the calling and the decoys, and your heart is beating out of your chest, and it is so cool right at the moment before they get close enough to shoot and you have your head down, careful not to move and fighting the urge to take just a little peek at where those damn geese are, are they close? and then you are waiting for the shot to get called, and you hear the command of "Take 'em! ", and then the thrill of the harvest.